I was recently thumbing through the book The Art of Social Media: Power Tips for Power Users by Guy Kawasaki & Peg Fitzpatrick and I came across a gem of a suggestion for handling heated topics and comments online. If you’re like me, you sometimes post something that is controversial and then the subsequent commentary quickly spirals out of control. 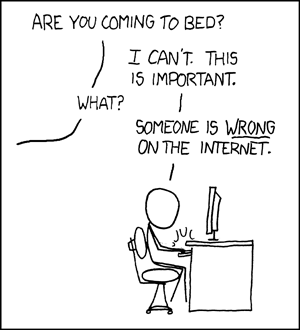 I don’t mind getting into an online discussion and sharing my opinions as well as seeing the opinions of others, but over the years it has become painfully obvious to me that it is impossible to win an argument on the Internet. My suggestion is that you embrace the rules of amateur boxing and fight for only three rounds. The opening bell is you share a post. Ding-ding. Round 1: Commenter comments. Round 2: You respond. Round 3: Commenter responds to the response. End of fight. How simple is that? You share something. You make your position known. Your guests get to have their voice heard. They even get the final word. I like it. Now if I can only remember to use it.